TNR -- TV News and Reviews: Chuck Me! 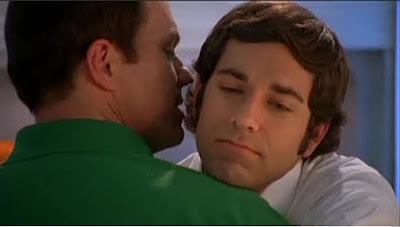 Here is my theory...last week was supposed to have been the series finale, but Chuck has alresdy been picked up and last night's episode was the proof of that...at least I'm hoping that's the case. Regardless, last night's epidoe was awesome, althoguh a bit Matrix-esque. The look on Caseyand SArah's faces after Chuck starts using kung fu on the agents was priceless. I couldn't help but feel sorry for Sarha after her weding got ruined. did you hear that they won't let her and Hiro be part of the Scrubs finale since they work for nbc and scrubs os on abc...wtf?!? Actually Bomer does have a series on USA. The series just got picked up so he wants to focus on that, hence killing Bryce in this episode. @MM: I really wish Chuck could tell his sister what's going on. She's suffered so much with all of these Chuck and Dad-related mishaps in her life. At least Awesome knows...I thought it was a bit crazy that no one every got curious about what the heck Chuck was up to. Last article I saw said Zachary Levi was participating in "Save Chuck" campaigns...here's hoping the network listens! I can't believe that they won't let them be on Scrubs because of the network shift. SO lame. that's what i said. i need to get on board with this save chick thing.